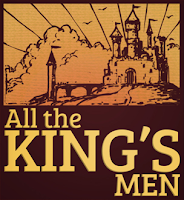 Todd and I have been busy working on a new game called "All the King's Men". (Yes, we finally named it if you've been following us on Facebook or Google+) It's not ready to be officially unveiled for play just yet, but here's a short run-through from our initial prototype. Originally the game was a simple puzzle grid where a player could choose between several pins to push off and collect gems of the same color. The end-goal was a bit vague and players scored by counting how many gems they pushed off. In the prototype photo below, the movement pins are represented by Lego bricks, the gems are Risk pieces, and the game board is the only part I can find of my marble chess set. Playing this version with friends quickly highlighted a problem: game-play felt like a sequence of solitary moves. 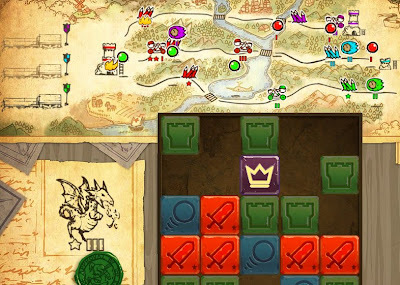 One player's move didn't really affect the next player's options, so there was no multiplayer strategy or fun to the game. After trying several variations, Todd decided it might be better to have each player play on their own board and their actions could effect the other players. This turned out to be a lot more fun. We had already found that the puzzle grid game-play worked best with three types of gems, so we turned that aspect into three ways to affect your opponents, scaled the puzzle grid from 8x8 to 5x5, and removed all but one movement pin. Since the primary interaction between players happens outside the grid, it served well to simplify that portion of the game. I love playing Castle Wars with my wife, so I thought a similar theme might work well for an overall goal and the three gems mechanic. We ultimately settled on armies, castles, and flying boulders, with the overall goal being for players to complete their castle or destroy all of their opponent's castles. To complete the setting, the player assumes the role of a medieval king standing at his war-room table, using the puzzle grid to gather his kingdom's resources and imprinting his seal on the resulting commands to send his valiant armies to battle. Getting ready to unleash Dwayne, the vicious dragon, on the battlefield. I'm looking forward to completing this game and making it available for play so someone with more skills than I can beat Todd. Sounds fun, Derek! Congratulations on all the wonderful work you're doing. Don't let Parker Bros sue you. They may still have a trademark on that name. 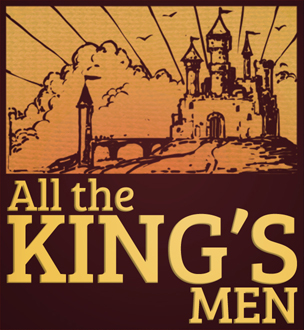 They had their own board game called "All the King's Men" in the 70's. Thanks for the heads up. I checked TESS and there's not a live trademark on "All the King's Men" that I could find other than for an entertainment troupe. I've been trying to play the game, but from the main screen, any button I click on besides SIGN IN does not respond. :( I loved this game and then the next week it didn't work! Hmm, I know Goko has been continuously working and updating their back-end platform, but that sounds more like an interface issue. What browser are you using? I just tried to replicate the problem and it seems to work correctly for me. Is there a user guide about this game? Yes, Goko put up a user guide in the game. 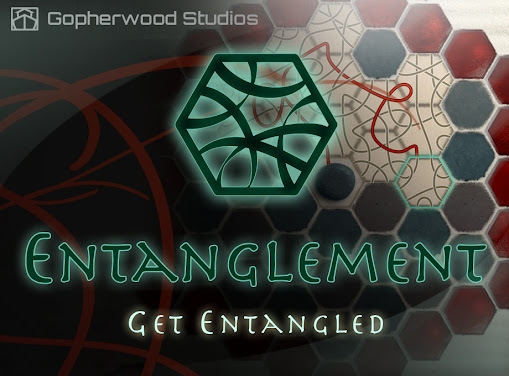 Look for it on the game's main menu; one of the listed buttons says "How To Play". Thanks for trying out All the King's Men!